A group of tacticians from the CNU NextGen: The Next Generation of New Urbanists and The Street Plans Collaborative produced this first of four open-source guides on the Tactical Urbanism movement. 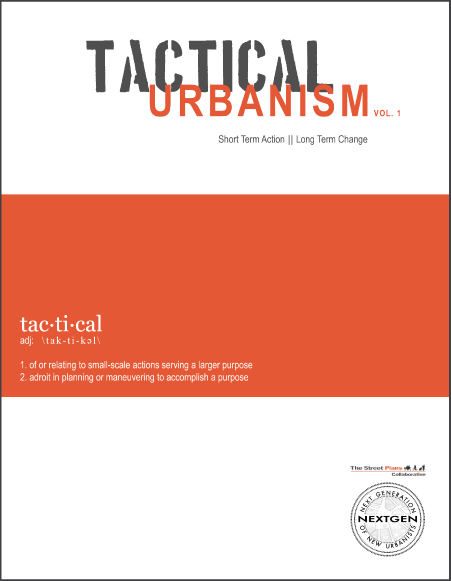 This volume defines Tactical Urbanism and provides both sanctioned and unsanctioned tactics that bring local solutions for local planning challenges and ones that help stage substantial investments in our towns and cities. It outlines 12 interventions including: Build a Better Block, Park(ing) Day, Play Streets, Open Streets, Pavement to Plazas, Pop-Up Cafes, Pop-Up Shops, Chair Bombing, Guerilla Gardening, Streets Fairs, Food Carts/Trucks, and Mobile Vendors.